For the last six weeks I’ve been working as an undercover agent – posing as a new customer for Kiwibank – New Zealand’s big little bank. Having been a customer of several other banks in previous occupations, at first I found this assignment a cinch. The undercover role was surprisingly similar to my own life – that of a 30-something year old male, with a mortgage, two kids and an overdrawn credit-card with a crippling interest rate of over 19%. I also happened to like the colour green – so this assignment was right up my alley. To get familiar with what I’d be up against I investigated Kiwibanks mortal enemies. To ensure my cover wouldn’t be blown I trailed the web network to access the bank’s online application for credit card transfers. It was all too easy – the electronic door was wide open – I was in! 15 minutes later my application was complete… Now I just had to sit back and wait for the card to arrive in the mail. Anxiously and with some excitement I checked my letter box daily. By week’s end – still nothing. Were they onto me already? Bank statements no older than 3 mths showing wages/salary going into account. Ah, tricksters! They are testing me right? OK – I can play their game. Doning a convincing customer persona I visited Kiwibank in Manners Mall, Wellington, clutching my bank statement no older than 3 mths showing wages/salary going into account. There’s a long queue of people and signs everywhere saying “postal transactions only”. Eventually I approach the lonely counter with a Kiwibank logo. A grumpy face greets me as I hand over the bank’s letter and my bank statement. “It’s explained in the letter – the bank has asked for bank statements no older than 3 mths showing wages/salary going into my account”. The customer service looks confused. “We don’t deal with these here”. “Oh?” I reply. “Where am I supposed to take it?”. “…I suppose I’ll have to send it away”. I ask if they can photocopy my bank statement. Grudgingly the face of customer service goes out the back while irritated looking customers queue up behind me. I’m feeling the pressure now. A few days later I get a phone call. “It says here that you need to provide us with the following – bank statements no older than 3 mths showing wages/salary going into account”. “It says here that you need to provide us with bank statements no older than 3 mths showing wages/salary going into account”. I phone Kiwibank during normal business, Monday to Friday 8am to 6pm. Doning a convincing customer persona I visit a Kiwibank in Panama Street, Wellington, clutching my bank statement no older than 3 mths showing wages/salary going into account, AS PER THE INSTRUCTIONS IN THE LETTER. I hand over the bank’s letter and my bank statement. “It’s in the letter – the bank has asked for bank statements no older than 3 mths showing wages/salary going into account”. “I’ll have to send it away”. Ah, that old trick. I ask if they can photocopy my bank statement. Irritated looking customers queue up behind me. “Now, I’m not sure if the bank will accept this”. I’m thrown – they’ve got me this time. On hold for at least five minutes (this is the bank calling themselves!). Irritated looking customers queue up behind me and are almost spilling onto the street. “We need an account with just your name on it. You need to prove these are your wages, even though these wages are going into your account. Problem is, it’s a joint account”. Customer Service consults Customer Service on the phone. “Yes, they’ll take a wages slip – so long as it has your name on it. Can you bring this in?”. By now they’d broken me – they win – I quit! Flabbergasted I wove past the irritated looking customers who had queued up behind me and were spilling onto the street. 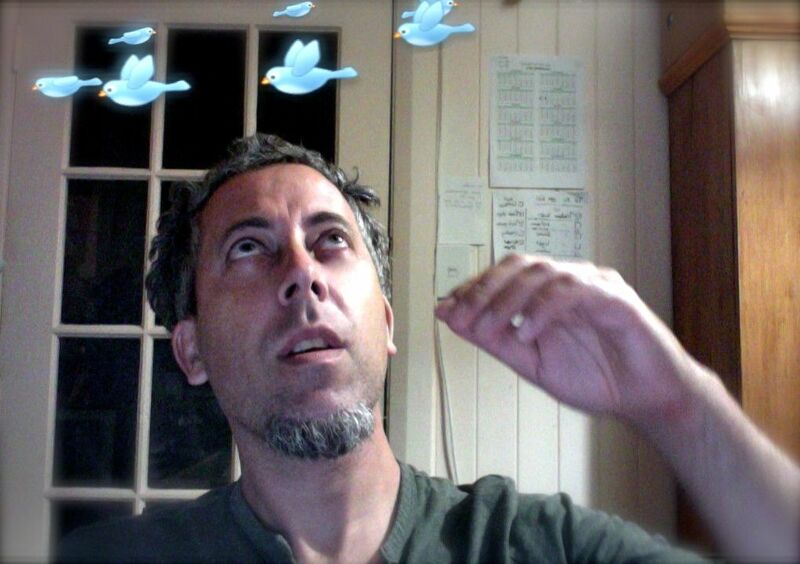 Back at the secret hideaway I pondered my past few weeks of the Kiwibank customer experience – and then it dawned on me – I had cracked it! 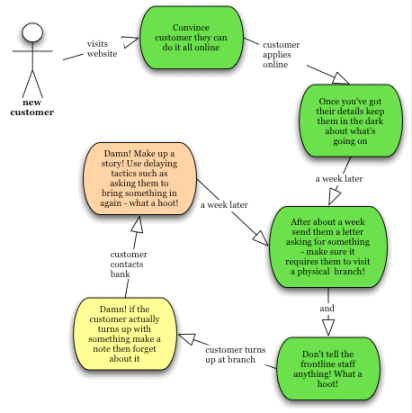 The Kiwibank secret formula for CRM (Customer Relationship Management)! 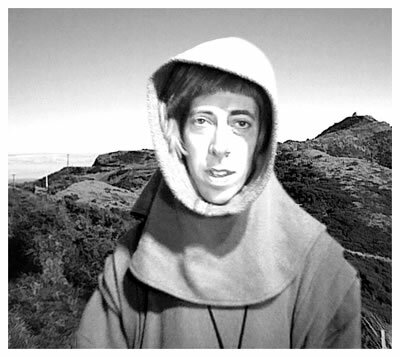 I find it hard to belive that you had to go through such a difficult time applying for your Kiwibank Credit Card. I am a dedicated employee of Kiwibank and stand by it’s E.A.S.I process. I would like to take this further and make an attempt to understand why you may have gone through such a "test" as you called it and investigate the events in processing your credit card application. I have taken a few details from the website and will be in touch with the author of this investigation. 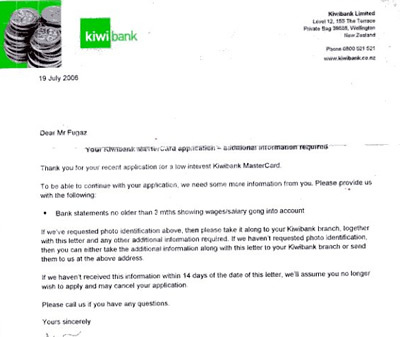 Since this post (in 2006) Kiwibank contacted me, acknowledged the issue and said they would review their process. Recently (in 2008) I’ve also had the opportunity to work with the bank and I’ve been greatly impressed by the attitude of the company and their renewed focus on the customer experience. So treat my post as a bit of history and a lesson which I hope helped make Kiwibank even better! I had a very similar experience with Kiwibank. I filled in all their forms online and then recieved a letter asking for all the extra neccessary paperwork including statements and photo ID which needed to be confirmed by a Kiwibank employee. On going to my closest branch I was told they only deal with loans and not credit card applications, so I left with the paper work in my hands and called Kiwibank to ask what was going on. They were very good over the phone and just told me to post it into them. I then recieved another letter asking for the same information I had already given them and on calling them they confirmed that they had receiebd it and told me to forget the letter, and then after all that my application was declined because I had gone over my other banks credit card limit by a few dollars whereby giving me a bad credit rating. I believe they have become complacent with their success.Kiwibank staff in some instances do not know their job as fully as a customer would expect and desire.It is a nuisance when you have to tell counter staff that they are in error and they go to management to find that the customer is indeed right. Anyway thanks to their coming into being other banks have now got their acts together and are competitive removing the need for "the peoples bank" and it’s crippling fees which appear on the statement requiring the phone call to have them explained.Nowadays I feel it is no better with it’s fees than the bank I originally left to join them.In fact the old bank is now very competitive with Kiwibank and is looking to be a very desirable alternative. The only thing attractrive about kiwibank is the number of branches but it is a damn nuisance having to being told you have to make an appointment to see a banking "expert". I too have had similar experienes with not just credit cards but home loans. The mobile Manager saw me quickly however I had to wait nearly a week to get an answer on my loan when competitors could do it same day or next day. it appears these Mobile Managers dont have the approval abilities of other banks and are managers in name only. The Manager was embarassed about the delay, apologetic but it appeared others at Kiwibank didn’t view my application as anything other than an inconvenience. When my loan was finally approved they didn’t issue me with a credit card (they had lost my prior credit application by the way) despite the manager requesting one on the same form as the home loan. The final straw came I wasn’t called about mortgage insurance and I had requested cover.